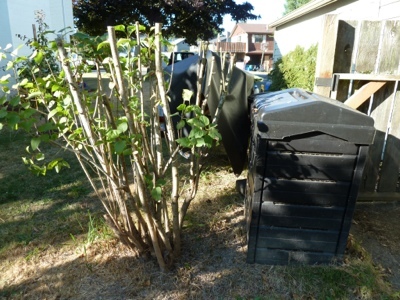 My Home and Garden: Another pile of debris for my poor husband to deal with. Another pile of debris for my poor husband to deal with. So, yet again I have forgotten to take a before picture. I just get into a project and go into a zen like zone. I am one with the ratcheting loppers...and then a mere three hours later, I'm done! Annnnnnnnd...'Oh, man I forgot to take a before picture'. This incredibly fantastic lilac pruning job is my latest rampage in the yard. This gorgeous lilac started the day, much taller than I am. About ten feet tall maybe. It had been suckering in that spot for about twenty years. Dozens of suckers. It was full of twigs and debris, and lots of grass and leaves. What got my attention in the first place today was the grass. It actually looked like wheat was coming out of the tree at about the three to four feet mark. I tried pulling it out again...it didn't work...again. So I started lopping it. And the rest is history. Do you think it's extreme?